Most people adapt to the use of pinholes immediately. Others need a period of time before feeling comfortable with them. This is similar to wearing bifocals for the first time and needing to get used to the fact that the viewed image seems to jump as it moves between the upper portion of the lens and the lower portion. This jump can also occur with pinholes and it will be covered in more detail below, together with other pinhole characteristics. Diffraction. The jump in bifocals is due to the different refraction or light-bending properties of the upper and lower segments of the glasses. In pinholes, the jump is due to diffraction. Diffraction is a bending or change in the direction of light when the light passes near the edge of an object. In a sense, it allows you to "look around the corner." This is happening all around us in our daily lives but we pay little attention to it. For example, when a light is observed through a fog, the tiny water particles diffract the light and give a halo effect to the light source. To observe this phenomenon wearing pinholes, cover one eye and look at a small, distant object through the center of a hole. Then turn your head and let the object move to the next hole. You will notice three things: 1) The object blurs as it nears the edge of the hole, 2) If you turn your head rapidly, the object seems to jump from the first hole to the second, and 3) If you turn your head slowly, you will see the double image that is created when the object is midway between the holes. One half of the double image will be coming through one pinhole and the other half through the adjoining hole. In other words, you will see the jump in progress. You would expect that the object would not be visible at all when you try to view it through the solid part of the glasses, but in reality you may see two images due to the diffraction of the light. The diagram below shows in exaggerated form how this occurs. If you imagine a ball moving past you from left to right, it is seen in its proper location at A. When it reaches C, it appears to be at B as seen through the first hole and at D as seen through the second hole. At E, it is once again at its proper location. The solid lines coming from C indicate the actual path of the light. 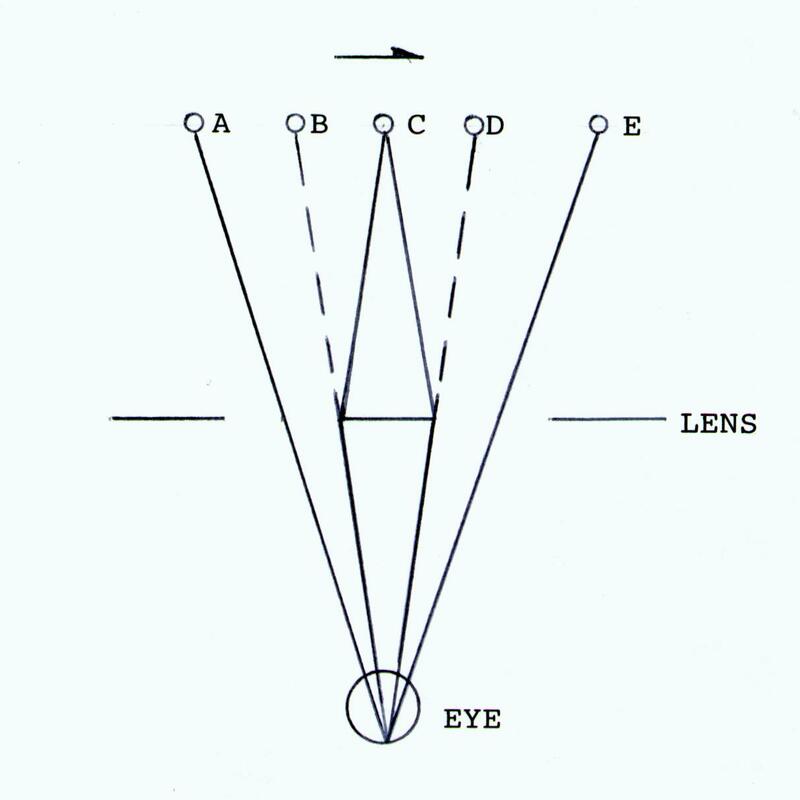 The dotted lines coming from B and D indicate where the eye believes the object to be. This process creates the double image. The jump occurs when the first half of the double image is replaced by the second one. Pinhole glasses typically have a hole diameter of about 1mm to 1.2mm and a spacing between the edges of the holes of 2mm to 3mm, depending on who makes them. If you are troubled by the jump/double image phenomenon, you will find this less noticeable with a wide spacing than with a close spacing because there is more opaque material between the holes to hide the effect. However, with the wider spacing, the honeycomb pattern is more noticeable. The decision is obviously a compromise. Since the modern pinholes that look like sunglasses have a mirror coating on the front that further reduces the light, such models may be provided with larger holes to compensate for the coating and allow more light to enter. Larger holes also allow more area to be seen through each hole. Other Considerations. A related curiosity of pinholes is that, depending on the distance, one eye may be seeing the viewed object clearly through the center of a hole while the other eye may see it as a double image because the material of the pinhole pattern is in the way. The brain chooses the clear image and ignores the unclear one. Given time, the brain learns to ignore such phenomena. Here's an example from everyday life. Focus on an object across the room and hold up your thumb at arm's length. You will see a double image of your thumb. In fact, everything between you and the object, as well as everything beyond the object, is seen in double due to our binocular vision. Close one eye and the effect disappears. The brain knows to ignore these double images and concentrate on the viewed object. Pinholes may require a certain amount of adaptation, and understanding the above characteristics of pinholes will facilitate making them a part of your life.